In the fourth in our occasional series on essential books for Pandaw passengers, Colin Donald recommends Charles Higham's The Civilisation of Angkor, the perfect primer for Cambodia's medieval metropolis. When Portuguese missionaries first encountered the lost city of Angkor in the 1550s, they presumed it had to have something to do with the Romans ("supposed to be the work of Trajan" said one early history). Naturally they presumed these astonishing jungle-bound buildings had nothing to do with the primitive agrarian Cambodian society they observed around them. Ever since then scholars have been struggling to come to terms with the scale of the relics of the Khmer empire, a civilisation that flourished between the 800s and the 1400s, under a succession of ruling dynasties. Much ingenuity has been expended on finding plausible explanations for the rise and fall of this race of architectural/engineering geniuses. Whole careers have been spent revealing the religious and political impulses behind the building of Angkor Wat, Angkor Thom, Preah Ko, Bantay Srei, and hundreds of other relics scattered over a 300-mile radius among the plains, hills and jungles of Cambodia and Thailand. It is not essential, of course, that Pandaw passengers encountering Angkor on our pioneering Mekong and Tonle Sap expeditions do their homework on the background to the civilisation of Angkor, but even getting a basic grip of the chronology will make their encounter with these great buildings more rewarding. A good place to start is with Charles Higham's The Civilisation of Angkor (2001), an authoritative synthesis of the recent archaeological scholarship on Angkor and the Khmers. Avoiding the temptation to be gushingly overawed by these vast buildings and reservoirs ("barays"), the book calmly considers current theories - mastery of flood-plain irrigation, agricultural surpluses, etc - on how such feats of labour were organised. Prof Higham (b 1939) a British archaeologist based at Otago University in New Zealand, is a reliable guide through the centuries and dynasties of the Khmer empire, thanks to his intimate knowledge of the epigraphy (stone tablet-writing) through which the Khmers transmitted their political and bureaucratic activities to posterity, not to mention fine detail of endless land disputes, and chest-beating boasts about the smiting of enemies, notably the Chams of Vietnam. Higham's book shows that, like all official records, these stone chronicles can be dull and not wholly trustworthy. Because their intention is to magnify the god-like qualities of their commissioners, they only obliquely flesh out the remarkable human and managerial qualities of all of these latter-day pharaohs: Jayaravarman VII, Surayavarman II, Rajendravarman I, and many others carefully and comprehensively listed here. How did these great builder-kings motivated their workforce? Angkor Wat, the centrepiece, took 20 years to build, while European cathedrals (all smaller) took hundreds. There were slaves in Cambodia, but Higham asserts this was not exactly a slave state. Nevertheless it is hard to believe that terror was not part of the incentive package for the thousands who laboured away their lives; quarrying, shifting and assembling these intricate fantasies in stone, while the nearby Tonle Sap lake and its flood plain provided a surplus of fish and rice to minimise the need for more practical tasks. Higham dismisses the 20th Century assumption, transmitted through the French colonial tradition and scholars like George Cœdès, which asserted that the Khmer aesthetic and technique was imposed on backward Cambodians by the then superior and more ancient civilisation of India. 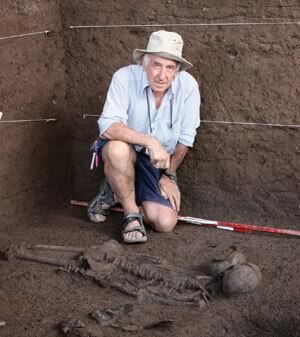 Recent archaeology, some of it conducted by the author, shows a clear line of development from Cambodia's prehistoric iron age leading into the Angkor period in the 800s. The many Indian touches, association of kings with Indian deities etc, represented the exotic tastes of the Cambodian elite, he claims, and not the impositions of domineering foreigners. Higham is an archaeologist, most concerned with piecing together the chronology of this homegrown civilisation from the elite records that were carved on stone and the stylistic evidence contained in the buildings themselves. His priority is to list the various kings in order and what they built, which provides much-needed clarity over speculation on politics or sociology. But as the illustrations of relief carvings here show, Khmer art was not all formal representations of Hindu cosmology but also contained a jolly strand of folk art, which humanises Angkor and provides a brilliant contrast to the regal-religious pomp. Alongside a fair amount of smiting of neighbours and torturing of the vanquished, temple walls show that life in the Khmer empire provided plenty of time for leisure; forest picnics, riverboat frolics, games of chess and dancing girls. In contrast to the "frigid smile of power" as Norman Lewis described the depictions of Angkor's kings, there is folksy charm and wit in these relief carvings intended to suggest to posterity that there was more to life than dragging stones and digging stupendous rectangular reservoirs. This is a book about the builders of Angkor and what we know about who built what when. The author has less to say about the buildings-as-buildings, their symbolic religious meaning or their powerful mix of organic shapes and classical symmetry. Would-be visitors should reach for The Civilisation of Angkor for a summary of what we know as fact; which is a lot more than we used to but with much left to speculate about. That process will continue. Angkor has held onto its secrets since its mysterious abandonment during the 1430s and despite the great strides summarised in this book, will never entirely give them up.